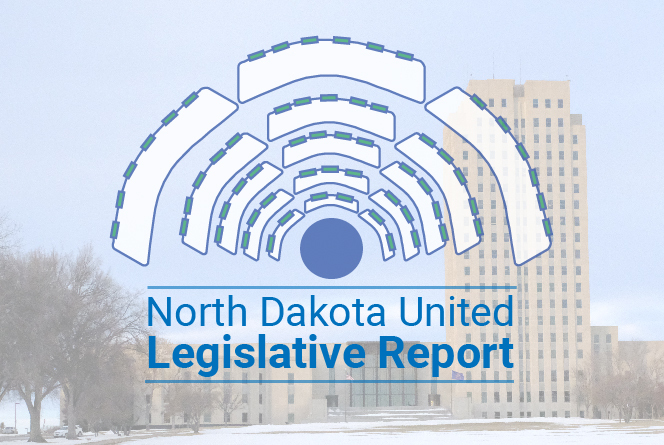 In this week’s report, we look at the economic outlook, gun bills, teacher licenses and more! Top o’ the morning to ya! That’s what I would have been saying to you if I’d sent this e-mail out on St. Patrick’s Day this past Sunday, but it’s also what I am saying to you right now because this legislative session is wearing me out and I don’t have the energy to think of a better beginning than that one. And now, on to all that writing I promised you! “Our revenue going forward looks very healthy,” said NDU President Archuleta. 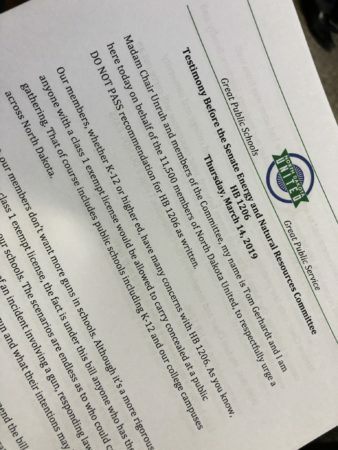 “(Governor Burgum) was adamant that these ideas he’s been pushing for should go through, and we can afford to do them.” So we will be keeping a close eye on the budgeting process going forward, with the hope that the Legislature recognizes the need to step up to the plate and make up for the cuts made to state agencies and higher education, and flattened funding given to K-12 education, during the last biennium. We have the funds available, so let’s use them to provide the highest-quality public education to our students, and public services to all the people of our state. Please? Pretty good chance we’ll be hearing more about this story in the coming weeks. We’ll keep you posted. HB 1206 is a bill that would allow anyone who possesses a class 1 exempt license to carry a concealed weapon into a “public gathering,” which is classified as “an athletic or sporting event, a school, a church, and a publicly owned or operated building.” This bill, which has already passed the House of Representatives, was heard by the Senate Energy and Natural Resources Committee this past Thursday. We testified against it. And then we have HB 1332, which is the “Armed First Responder” bill. This is meant to primarily assist smaller, rural schools, at which law enforcement would have a difficult time responding to an incident at a school in a quick manner. These school districts could apply for permission to allow selected personnel already on school grounds to conceal carry, and to train them on how to respond in the event of an armed intruder. This bill, also passed by the House of Representatives, was also heard by the Senate ENR Committee on Thursday. We oppose this one, too. Speaking of bad-faith efforts to address the teacher shortage in our state … HB 1347, everyone. This is the bill that will increase the length of time that teachers remain on “probation” after being hired. Currently, that period of time lasts one year, which is comparable to the private sector and among other classifications of public employees. HB 1347 seeks to increase that probationary period to three years. Because reasons. Stay tuned to our NDU website at www.ndunited.org, our Facebook at www.facebook.com/ndunited and Twitter at twitter.com/ndunited, for the latest news on what is happening, and what you can do to help. Please 🙏 and thank you 😊. SB 2217 — “A BILL for an Act to provide for a legislative management study of a teacher incentive for leadership program.” The Teacher Incentives for Leadership in Education (TILE) bill was turned into a study, “and we hope that they do study this issue,” President Archuleta said, “because what the TILE bill would do is it provides an opportunity for teachers to get into leadership positions without having to leave the classroom and become an administrator. This is an excellent way to do this.” Support. HCR 3016 — “A concurrent resolution to amend and reenact subsection 1 of section 6 of article VIII and sections 12 and 13 of article IX of the Constitution of North Dakota, relating to the names, locations, and missions of the institutions of higher education.which removes references to names, locations & missions of higher ed institutions.” Presidents from Minot State University, Mayville State University and the North Dakota University System were on hand to testify against this resolution in committee today, citing flexibility now to adjust to changes and the fear those communities feel about closing institutions. Oppose. HB 1470 — “Relating to family leave for state employees; and to provide for a legislative management study of state employee leave policies.” This received a 7-0 “do pass” recommendation from the Senate Government and Veteran Affairs Committee on Friday, and was placed on the calendar. Support. Another week, another sigh of relief at having finished this report! And we’re another week closer to the finish line. Stay with us! We’re almost there! 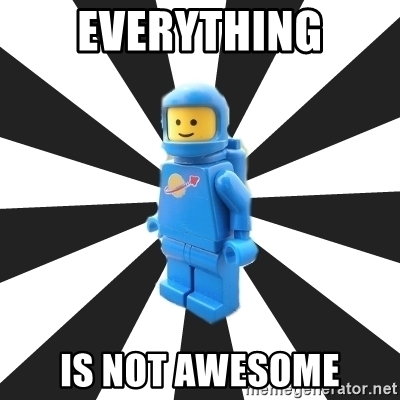 If I may borrow a phrase from a song in The Lego Movie 2: The Second Part, “Everything’s not awesome. Things can’t be awesome all of the time. It’s not realistic expectation. But that doesn’t mean we shouldn’t try.” The name I answer to is Kelly Hagen, NDU communications director, and you can get my attention by clicking on that link and sending me an e-mail. See you again next week!